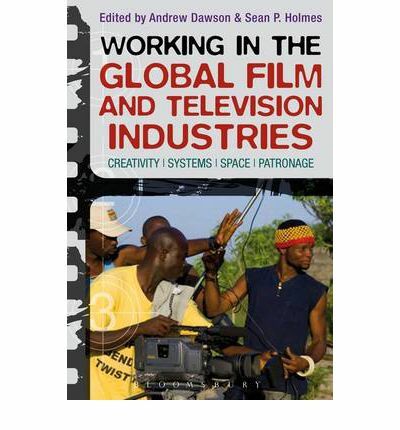 In one of the first collections of its kind, Andrew Dawson and Sean P. Holmes’ Working in the Global Film and Television Industries brings together essays that explore the struggles of media workers globally and historically. Dawson and Holmes’ collection specifically highlights the human labor involved in the production of film and television, offering a corrective to years of scholarship that have positioned film and television as cultural texts with very little reference to the people who actually make these products possible. The chapters in this collection take seriously the industrial side of media production and focus on those factors that contribute to the establishment, maintenance, and shaping of an industry. Accordingly, the essays engage with the division of labor, broad shifts in the organization of production, the role of the state, and the impact of a globalized economy, among other macro phenomena. In addition to recognizing the diverse labor struggles of media workers, Working in the Global Film and Television Industries contributes to scholarship that questions the hierarchical distinctions between above and below-the-line labor and illustrates how these distinctions vary based on time and place. Although the essays Dawson and Holmes include feature work from across disciplines and approaches, the editors organize the chapters into four central categories: systems of production, manoeuvrable spaces, patronage and clientelism, and creative agency. The first set of essays organized under the systems of production theme compare and contrast the effects of free-market “flexible specialization” in 1980s Hollywood, Soviet-controlled film production in the early 1960s, and government-sponsored media production in Sweden today. In his chapter, Andrew Dawson discusses the historical and industrial context for the formation of the “flexible specialization” (FS) theory, an idea popularized by Susan Christopherson and Michael Storper. FS theory explained the continued health of Hollywood following the studio breakup by arguing that the industry leveraged risk and encouraged growth by farming out production services to a pool of smaller local businesses that competed for project contracts. Dawson critiques FS’s foundational claims that such a condition improves the working lives of media labor, instead arguing that the financial risks of production were passed down the chain to smaller firms and straight onto the very backs of the freelance labor force. Offering an analysis of a starkly different system of production, Galina Gornostaeva explores Soviet filmmaking in the period following the Kruschev “thaw,” which brought reduced censorship and greater freedom for the arts. Gornostaeva traces relationships between party members, studio administrators, creative units, and filmmakers, delineating a state-run industry that functioned based on patronage and clientelism within social networks of incentives and privilege. As a structural arrangement between free-market conditions and a state-controlled industry, Olof Hedling illustrates how Swedish state support uses local funding and coproduction services to create and foster production hubs, improving both the local and national economies. Hedling focuses his analysis on Ystad, a small town in the Skane region that grew its industry around author Henning Mankel’s fictional character detective Wallander. While an illuminating look at how a single intellectual property can lead to the emergence of a production cluster, Hedling spends most of his chapter establishing the Floridian creative economy model for the Skane region and only returns to the impact of these conditions on creative labor in the conclusion of his chapter; it would have been nice to see more analysis of the actual labor conditions on the ground. The second cluster of chapters in Working in the Global Film and Television Industries investigates Barry King’s star studies concept of “manoeuvrable space,” another way of discussing worker autonomy, across early silent movie stars (Holmes), British television industry freelance labor (Paterson), and the working practices in Nollywood (Obiaya). Using Jetta Goudal’s struggle to control her studio-created public persona in the 1920s, Sean P. Holmes argues that top actors and actresses do not automatically receive autonomy but must fight for and win it in historically contingent contexts. Moving from above-the-line to below-the-line, Richard Paterson analyses major changes to UK television production labor in the late 1990s, arguing that a “contractual discourse” emerged among freelance labor defined by its concern with uncertainty, insecurity, discontinuity, and dependence on formal and informal networks to secure future employment. Ikechukwu Obiaya explores similar maneuverability and discourse construction amongst Nigerian craft labor. Obiaya suggests that the democratizing effect of low-cost video filmmaking lead to a massive labor pool – some estimate over 1 million people – and the subsequent craft worker struggles to establish criteria for professionalism. In this way, Obiaya’s work furthers inquiry into the Nigerian film industry by scholars such as Brian Larkin and Jade Miller, but also contributes to a larger study of how informally trained media labor tries to maintain and police its own version of professionalism, a phenomenon Vicki Mayer addresses in Below the Line. Although a recurring theme across several chapters, Dawson and Holmes third section is specifically devoted to patronage and clientelism in film and television production. First, Katrien Pype explores the impact of production sponsorship in Kinsasha, DRC, revealing how representatives from institutions like the church and government support acting troupes and their television productions in exchange for control over the content. In a completely different context, Alison Smith looks at networks of patronage for French female directors, noting that despite gains in the number of women behind the camera, men are still disproportionately represented in leadership roles across productions and guilds. Among all the sections, part three feels the least cohesive, and contributes to the sense that an alternative organization for the volume could have highlighted the connections between both of these chapters and other work in the collection. A concept closely related to “maneuverable spaces”, the final section of Working in the Global Film and Television Industries features work situated around the problem of “creative agency” for media workers. Again echoing recent work by Vicki Mayer, chapters in this section challenge industry distinctions between above and below-the-line labor, particularly when those distinctions police what work counts as creative. For instance, exploring production cultures in 1950s England, Linda Merchant’s work on pool studio photographer Cornel Lucas illustrates the tension between Lucas’ own artistic decisions and the company style guides to photographic representations of the studio. Thus, Merchant usefully connects one aspect of production culture – studio photographers – to the filmmaking process writ large in order to explore larger tensions between standardization and innovation in film production. Highlighting another usually overlooked group, Wilkinson-Weber explores the impact India’s market liberalization had on Bollywood hair and makeup artists. Specifically, Wilkinson-Weber shows how the emergence of beauty and grooming products in the country altered labor practices for hair and makeup artists used to relying on their ability to improvise and make do with scarce resources. Together, the essays in this final section suggest that creativity is not an individual attribute but rather the result of the social nature of production. Yet despite the rich body of scholarship on offer, there are a few modest critiques one could make of the collection. While the book’s chapters are organized into four central themes, the volume’s introduction offers several other potential themes that might have better served the connection between certain chapters and the structure of the book as a whole. Why not, for instance, dedicate sections of the book to the “role of the state” or “labor relations and unionization”, if several of the chapters necessitate brief tableaus on the themes in the introduction? Likewise, the historical perspectives are welcome, but the inclusion of these historical chapters, along with the varied disciplinary and methodological approaches, creates a unique academic tapestry that might frustrate scholars looking for a more unified, cohesive collection of essays dealing with the work happening in today’s global media industries. Finally, as the editors themselves admit, the collection suffers from a few global blindspots – namely Latin America and Australasia – as well as a limited selection of below-the-line craftspeople; on the other hand, the anthology’s diverse mixture of above and below-the-line positions does insist that the usually distinct hierarchal positions be analyzed together. Despite these arguably minor criticisms, Andrew Dawson and Sean P. Holmes’ Working in the Global Film and Television Industries usefully contributes to several pressing and longstanding debates concerning the global struggles of creative labor. Additionally, the collection offers a diverse body of scholarship that encourages comparisons across method, media, history and geography. In these ways, the collection of essays is a welcome addition to the growing scholarship on media industries and labor.